With Pro Tour Dominaria coming up this weekend, find out where battle lines are drawn, what old tech might be back + a brand new archetype for Standard! Goblin Chainwhirler is the kind of card that can get Patrick Chapin to play Unlicensed Disintegration! 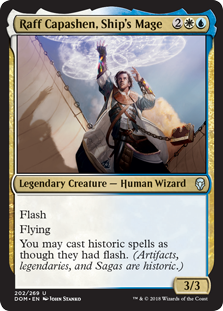 Learn all about what makes Chainwhirler so good here. History of Benalia is a three mana Saga. A Saga is a sorcery-speed enchantment. It produces two power on the first turn you play it. Then, when you reach Chapter II of the Saga, it produces an additional two power. Consequently -- and not to be too obvious -- but that is four power across multiple bodies for three total mana. 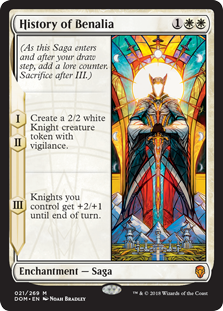 Thanks to Chapter III's "Knights you control get +2/+1 until end of turn[,]" with only the two Knights, you can attack for eight on the card's third turn in play! Because of this, History of Benalia can both burst forward offensively and slow the opponent down with multiple blockers defensively. Lingering Souls is a card of extraordinary power. It was banned in its original Block Constructed format, and has contributed to any number of decks across multiple formats. Not Block of course, but other formats. Jon Finkel played it to his umpteenth Pro Tour Top 8 in an Esper Delver deck. It has contributed to everything from a white splash in Jund to a colorful wink in Eldrazi Modern decks. Like History of Benalia, Lingering Souls produces two power for your initial three mana investment. To get the next two power, you need to invest an additional two mana (and in another color). Certainly, Lingering Souls has some considerable upside relative to History of Benalia. You get more bodies. Those bodies in fact fly. You can get all four on on turn if you have five mana available... But that's the crux of it; with History of Benalia, you never need to pay the additional two mana! Raff Capashen, Ship's Mage really likes Historic cards. "Saga" is a Historic type; consequently, Raff likes History of Benalia. One of the many synergies that you can exploit thanks to Dominaria's heavily Historic themes is to play History of Benalia during times that you couldn't normally play an enchantment or other sorcery-speed card (e.g. Lingering Souls). History of Benalia has already started showing up in a variety of decks. It is going to be a great card in Historic-themed decks, white swarm decks (or B/W Tokens decks), and will be a consideration for everything from G/W Aggro to U/W Control. Someone should write a song about how good this card is. But for now, please settle for this podcast. Lyra Dawnbringer was at least the second most successful Dominaria card of the set's first sanctioned weekend. The Legendary Angel wasn't the most successful Dominaria card to debut this past week. That honor would belong to Llanowar Elves... But in at least one MTGO 5-0 deck, Angel and Elf Druid worked hand in hand. And what is better than Shalai, Voice of Penty followed by the Dawnbringer? In times past, tapping out for an awesome 5/5 creature might be good defense... But it can stink when the opponent removes it and crushes you with an attack. If you lead off with Shalai, Lyra will have hexproof. 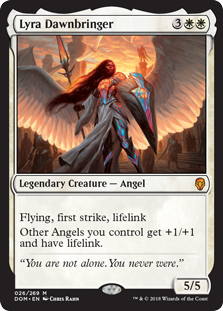 So not only will she not be going anywhere (unless the opponent removes your other Angel), but Shalai will crush in with lifelink. Par-tay. Raff Capashen, Ship's Mage changes everything! Leading off with this creature on turn four (presumably at the end of the opponent's turn, ideally when the coast is clear), you will be able to play cards like Lyra at instant speed! Instant speed Teferi, Hero of Dominaria? It may seem counterintuitive to play a planeswalker on the opponent's turn, but the ability to guarantee it resolves may be worth one lost activation. If there is a card that will have zero trouble recouping the lost utility, it is the card-advantageous Teferi. One of the cool things about Lyra is that she isn't even played main deck all the time! U/W decks in the market for creatures might play it main (or they might play only Torrential Gearhulk). But Approach of the Second Sun decks probably wouldn't. Neither would Orzhov Tokens or white Swarm decks.